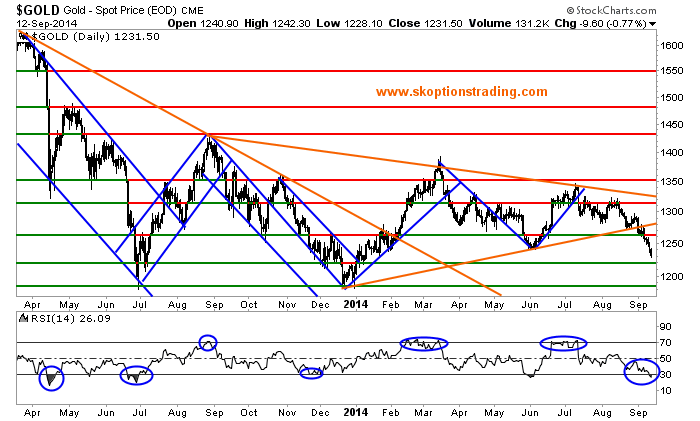 The recent action by the ECB appears to have caught many gold bulls off guard. A common interpretation of the impact that a potential quantitative easing program would have on gold prices was that it would be very bullish. This argument was based on the concept that money printing is bullish for gold, and that QE1 and QE2 by the Fed triggered major rallies in the yellow metal. Whilst we do not dispute that QE1 and QE2 by the Fed were indeed bullish for gold, we strongly disagreed that the ECB would introduce a program that would spark a major rally. In fact we went further, predicting that what the ECB was going to do was in fact highly bearish for gold, and in this article we will endeavour to explain why. There are some key concepts to understand about what the ECB is doing and how that differs from the generic QE programs implemented by the Fed and other central banks. Whilst the Fed’s QE programs led us to the view that gold prices were heading higher during the years 2009-2011, there are seemingly minor but actually crucial differences in the ECB’s QE led us to reaffirm our view that gold prices were heading south. When the Fed first implemented QE their goal was to stimulate the economy by keeping long term interest rates low and injecting cash into the financial system. The Fed targeted buying long term Treasuries (US Government debt), aiming to push the price of that debt higher and yields lower. This would ensure that longer term borrowing costs were kept low in order to stimulate the economy. The ECB is not trying to get long term interest rates lower; these are already at all-time lows. They are not buying government bonds. Instead the ECB is engaged in a program of purchasing Asset Backed Securities (ABS) with the objective of incentivizing banks to lend. An ABS is a financial security backed by a loan, lease or receivables against assets other than real estate and mortgage-backed securities. For investors, asset backed securities are an alternative to investing in corporate debt. They are similar to the Mortgage Backed Securities (MBS) that the Fed began purchasing with QE3. Just as the Fed bought MBS with the aim of stimulating lending in the housing market, the ECB is attempting to target corporate lending by purchasing ABS. As one will recall, QE3 by the Fed was actually very bearish for gold. If this sounds counter-intuitive, and it is somewhat, particularly given a backdrop where pumping money into the system had been bullish for gold. Although QE3 had been put under the same banner as the previous two programs, the change in its detail actually had the reverse impact on gold prices. We recognised this subtle difference and the vastly different implication it had. This resulted in us aggressively shorting gold and gold mining stocks through 2013 and largely contributed to our 92% return during that year. Therefore, we see the ECB’s QE program as negative for gold prices. The program will stimulate corporate borrowing and economic expansion, but will not drive interest rates lower and will be bearish for gold. We therefore went short gold into the ECB meeting and continue to think that gold prices are biased lower. There is also the currency implication; with QE by the ECB potentially further weakening the Euro it therefore strengthens the USD as a knock on effect. It is harder for gold to rally in USD if the USD is getting stronger. We think that those who view QE as bullish for gold are missing the point and overlooking crucial technical details in programs. All QE is not the same. QE1 and QE2 by the Fed were perhaps the most similar, but they had very different implications compared with Operation Twist and QE3. The ECB’s QE program is also a different beast. It is vital to understand these differences and their implications on financial markets. Placing all these stimulus programs under the same category simply because they have the similar acronyms is a reckless investment decision; one must work to understand the finer details. If one has not been convinced by the above arguments, then the recent price action should put the final nails in the coffin for those who view the ECB’s QE as bullish for gold. Gold prices have broken through key support levels and now have their sights set on our $1180 target. When one considers that gold prices have tumbled despite a weaker US payrolls print, increasing tensions in the Ukraine and Obama announcing air strikes on Iran, it becomes clear what a weak position the yellow metal is in. Those geopolitical factors should have supported gold, and indeed they have provided bumps in the price throughout the year, but the bearish implications of the ECB’s QE program have dwarfed these bullish headlines. 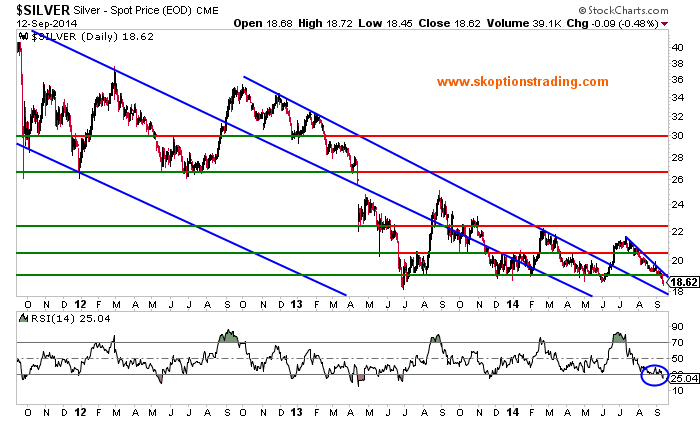 In silver the technical picture looks even worse, with the critical support zone around $18-19 in serious jeopardy. Whilst both gold and silver may get a minor bounce back given their oversold levels, any bounce should be faded and used to add to shorts given the overwhelmingly bearish macroeconomic backdrop. The Fed meeting this week is unlikely to provide any relief to gold bulls. The US Dollar has been gaining against other currencies this week in expectation that the Federal Reserve may use this meeting to set the groundwork for an interest rate rise next year. Discussion of rate hikes are bullish for the USD and bearish for gold. We will be looking for Yellen to remove the phrase “considerable time” from the statement as a signal the Fed stands ready to begin hiking next year. It could even be replaced by a phrase indicating the timing of hikes is data dependant, but given that payrolls have been printing at over 200k on average for over a year we think this would be a strong signal that the Fed stands ready to hike, particularly now that tapering is coming to an end. A hawkish Fed discussing future rate hikes will force gold to test $1180 sooner than many might think. Given a new QE program by the ECB that is bearish for gold, a Federal Reserve that stands ready to increase interest rates next year and a very weak technical picture we continue to hold the view that gold and silver prices are currently at unsustainably high levels. The next big support for gold is at $1180 and this could be tested very soon should Yellen have a hawkish tone. Whilst gold and silver could have a small bounce from these levels we think that any attempt to move higher will be feeble and short lived, therefore this is move to be faded and used to add or initiate short positions. Over the medium term we see gold trading down to $1030 and therefore we will most likely maintain a core short position until that level is reached.